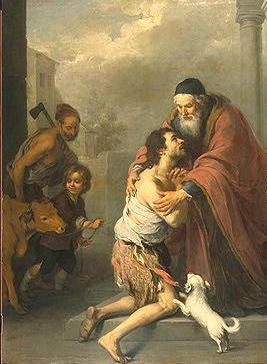 Most of us know the parable of the prodigal son (Luke 15:11). A young man goes to his father and asks for his inheritance. The son takes the money and travels to another country, where he plans to establish a business. Instead, he squanders the money on prostitutes and drunken parties. Then there is a famine and he longs to eat the swill that is fed to the pigs, but it is not offered to him. His clothes hang like rags on a skeleton. His body smells and nobody wants to come near him. Having made such a mess of his life, how could he possibly return to the family home? What is he to do? He can stay where he is and die or go home and live. Although he is deeply ashamed, he decides to go home, to beg his father’s forgiveness and to ask to work as a hired hand. When he sees his emaciated-looking son coming down the road, he hurries to greet him; tears of joy fill his eyes. Despite the dirt and smells, he throws his arms around his son. There are no harsh criticisms spoken, and no explanations or apologies demanded. If the person returning home is a prodigal daughter, the emotions and reactions of the loving father would be the same. The daughter may be addicted to drugs or alcohol. She may have worked as a prostitute or had an abortion. Her life may be in ruins because of bad decisions or a disastrous marriage. Like the prodigal son, she may be broken in body and spirit. She may ask who would love her after all that has happened. It would be natural for her to feel that nobody really understands or even cares. What Our Father sees is His beloved child who is tremendously unhappy. He feels her pain and wants to hold her and comfort her, as a father would his child. No matter what your situation, ask God to come into your life and to be your Father. He waits with a deep longing for you to ask Him. He will wipe away your tears. What does Christ want you to learn from this parable? Jesus loves you so much. Focus on His love, not on your sins. He wants you to return to Him no matter what you have done or how many times you fail. He will forgive any sin if you are sorry and struggle to change your behavior. Christ asks you to forgive others as He has forgiven you.